Event planners are required to come up with an agenda for the meetings as well as the events they organise. Writing an agenda for a retreat itinerary can be at times challenging, considering there is a lot of information that needs to added in a non-complicated and stuffy manner. The first priority for the agenda is to make sure that all the guests and attendees are familiar with the program. Along with being informative, the agenda should be easy to comprehend and comfortable to associate with. You may also see agenda calendar templates. 1.Name, date and location of the event. 2. The specific times and days for activities. 3. The items listed should be brief and easy to follow. 4. Mention a time and place for each and every activity. There is a generally standard format for a sample agenda templates. Look through the following three pointers to get a basic idea about the agenda. First, the agenda needs to have a header section in the center with one or two lines of the text. After this, the agenda will have information presented in two columns. The left column should discuss the day and time information. The right column needs to send detailed descriptions of the agenda or itinerary items.You may also see meeting agenda templates. The agenda should be easy to follow and must be summarized in one page. As there are several other documents attached to the agenda, you can give an in depth information of the activities planned in those documents.You may also see project agenda templates. The strategic planning session for an agenda greatly depends on the needs of each organisation. However, most of the strategic planning meeting agenda for a retreat have a similar structure. We would advise you to include your team in the planning process as soon as possible. This will help to understand the company-wide majority for the activities planned for the retreat. 1. Know the purpose behind the agenda: Make sure you stick to the main purpose and refrain from deviating into the issues and areas that do not concern to the executive retreat. 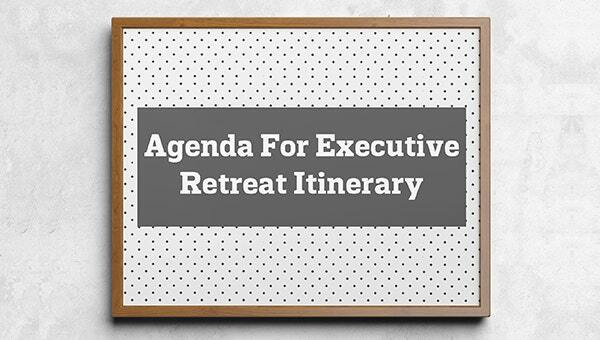 You can go through this retreat agenda templates for gaining a better understanding about the agenda outline. 2. Know the number of people expected: Make sure you know the number of people expected for the retreat. This basic yet crucial information will help you plan the retreat without any big goof-ups. 3. Understand the group’s culture: Make sure you understand the group’s culture before you plan a formal itinerary. This knowledge will keep the agenda professional, interesting and fascinating for all. 4. Leave some breathing room: Try to not make the agenda very rigid and uncompromising, leave some room for flexibility and sudden change of circumstance. This will allow the retreat to be enjoyable for all the members involved. 5+ Homework Agenda Templates – Free Sample, Example, Format Download!